...reading Ian Rankin's latest novel "The Complaints'. Still stuck in crime fiction though at least I've moved on, momentarily, from the Scandinavians. ...listening to ABC Radio National, my main source of information about the world. I listen to its news programs, but really enjoy the commentary it offers on such things as films, books, health, law and world events. ...watching 'The Private Lives of Pippa Lee' after work today. A film about a fiftyish woman coming to terms with the very diverse stages of her life. Super performances from Robyn Wright Penn and Alan Arkin. ...eating teriyaki chicken with rice and salad. I've been so hungry today. ...drinking fizzy water. I'm trying to lose weight, so I keep no wine in the house...and I need to compensate for the pleasure of bubbly consumed at knitting group last night! ...making Nancy Bush's 'Welsh Country Stockings' and a russet coloured reversible cabled knitted gift scarf. ...waiting for the next stage of my life. I feel as if I'm marking time just now - pleasantly - but marking time. ...wondering what's happening with my son - he's a risk-taker living in quite a dangerous part of the world and is not the best of correspondents. Maybe this is worrying rather than wondering. ...hoping that I can grow older in good health and maintain my independence. ...thinking that I need to organise myself better. I've borrowed (stolen?) these prompts from a blog I've been enjoying recently - 'Say La Vee'. The blogger, Blackbird, gives running descriptions of 'Survivor' episodes - isn't that wonderful? I've been to see the Australian Opera's current production of the Benjamin Britten opera, "Peter Grimes'. It's a thrilling, if grim, evening out. Britten's opera is based on an 1810 poem, 'The Borough', by George Crabb and is a tale of grim, hard-working lives lived out in a judgmental, unforgiving community. Britten - or maybe Neil Armfield who directed this production - set the story in an English east-coast fishing village in the immediate post second world war period. The small town claustrophobia is emphasised by the set - a dull and austere church or village hall. Peter Grimes is a fisherman who decides earning money through his own unrelenting labour and the brutal exploitation of his boy apprentices is the only way to gain grudging acceptance and admiration from his community. But the townspeople judge him harshly when first one and then a second apprentice dies in his employ. The music wrenches your emotions - whether it's Grimes' defiance of the community's opinions, schoolmistress Ellen's despair at the apprentices' fate, or the community's damning of Grimes. Stuart Skelton, large and unkempt, sang superbly as Peter Grimes, and the chorus of townspeople brought shivers to the back of my neck. 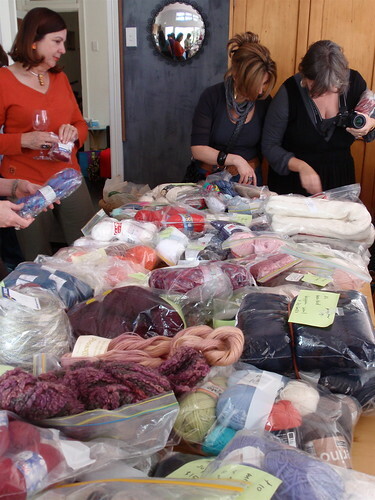 And for knitters there was so much to see. Tess Schofield, who seems to specialise somewhat in her knowledge of the immediate post-war period, was responsible for the costumes and there was just so much knitting. Of course, large thick fisherman's jerseys, and fair-isle vests and buttoned-up cardigans under jackets on the men. And cardigans - rather fitted and cabled - on the women. Most of the colours were drab and dull but two sisters - flibbertigibbets or perhaps even more morally questionable - were dressed in blue and green finely cabled cardigans over floral shirt-dresses, with the collars of the dresses neatly turned out over the cardigans. I wasn't close enough to the stage to tell if they really were handknits, but I do hope they were. If they weren't they were wonderful facsimiles. I decided to take a break from everything associated with Henry. Different yarn, thicker ply, bigger needles, and a new pattern. Such a relief. The pattern is 'Steam' - a free pattern from Diana Gates. It's an absolutely unadorned 2x2 rib with three biggish cables. The colour's much the same - a deep brick red - but this time the yarn is Morris and Sons' Empire 8 ply 100% wool (bought at their current sale - it hasn't even had time to enter my yarn collection). It's a project I can relax with. My relationship with Henry has been brief and intense. My admiration is undiminished, but I've decided it's all just too hard; too high maintenance. Yesterday I pulled out the knitting I'd done and started again because I knew I'd regret the mistake I'd made. But the crunch came this morning when I spent the whole morning knitting a row (452 stitches), realising I had one too many stitches, trying to identify where I'd gone wrong, counting stitches, counting them again, pulling out the row (452 stitches), knitting again, still having the wrong number of stitches, trying to identify from the almost invisible sequence of the pattern where I might have gone wrong, counting stitches, counting again, etc etc. I feel cowardly in giving up so quickly, but I have other yarn dalliances I want to indulge, and Henry is just taking up too much time. So, Henry has been reassigned to the list of things I plan to do when I have more free time in my life and (hopefully) have more capacity for painstaking tasks. I know I'm not the first to abandon Henry, and I think that makes me feel a little better, but I do hate relinquishing something I admire so much. 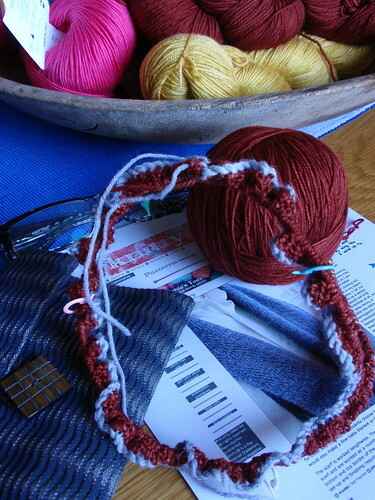 So, I'm in the market for a pattern for a man's scarf - not kerchief style - preferably from 4 ply yarn. Suggestions gratefully received. I think I came home with about the same amount of yarn and money I had at the beginning of the afternoon - but some of the yarn is different. Great fun. Thanks to the ever-generous MissFee for hosting the afternoon (and for 'baggsing' for me some lovely grey laceweight yarn). There was lots of relaxing knitting and eating and chatting. 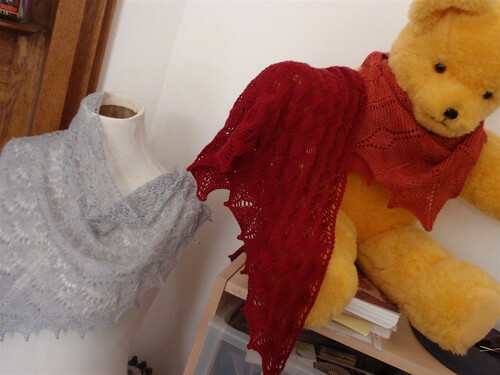 The silver-grey Swallowtail shawl in very fine silk laceweight is my favourite, but Big Ted's preferences were other small shawls in shades of red. I think red suits him. I've cast on for a new project and I'm already worried that I've taken on something that's just too hard. For some time I've been periodically glancing at Marieke Sattler's 'Henry' scarf in Knitty and admiring its simple, unfussy elegance. I've always loved tweeds and twills and self-patterning weaves, and this scarf fits within this tradition - conservative and a bit daggy in the best of all possible ways. 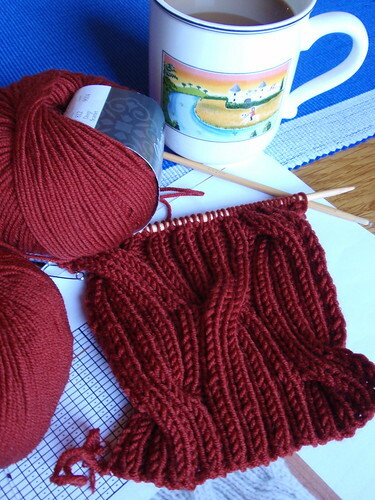 I decided that it would be perfect in the rich Botticelli Red colour of Malabrigo sock yarn. So far, so good. 1 The scarf is knitted lengthwise, which means I have 452 stitches on the needles. It takes me an eternity to knit a single row. 2 I already made an error on the setting up rows for which I've cobbled together a clumsy 'correction'. I know it's there and I'm hoping it won't come to haunt me. Normally I would simply unpull the whole thing and start again, but with 452 stitches I can't bear the thought. 3 The pattern involves much yarn forwarding and backwarding and slipping of stitches - the kind of pattern where one miscounted stitch can put the whole 452 out of alignment. I can't afford to even think of this as I'm knitting as I just get more and more unconfident. It's like driving a car - you're fine as long as you can avoid thinking about all the things that could go wrong. 5 While I love the deep brick red yarn, at night-time under artificial light it's just so hard to see clearly, and I have very limited day-time knitting time. I'll persist for a while longer, and I'll try to resist pulling it all out to remedy the mistake in the set-up rows. It's the week-end, so maybe some daytime knitting on Henry will restore my confidence. I'll update you next week. I've made a real effort with my 2009 Personal Sock Club socks number 5 and have finished them in just sixteen days. I've astonished myself, as I just wouldn't have thought this possible. 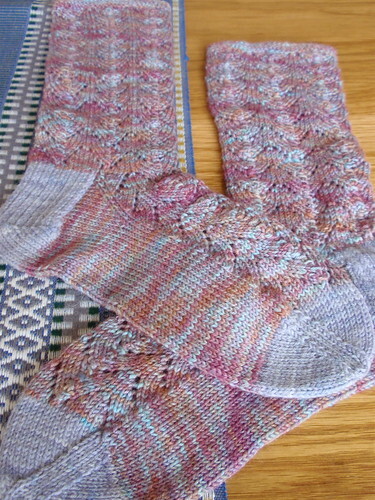 I've used Jane Lithgow's Cornish Scallop Sock pattern, made from Araucania Ranco Multy yarn. The yarn is a mixture of soft grey, pink and a kind of light brownish-burgundy. 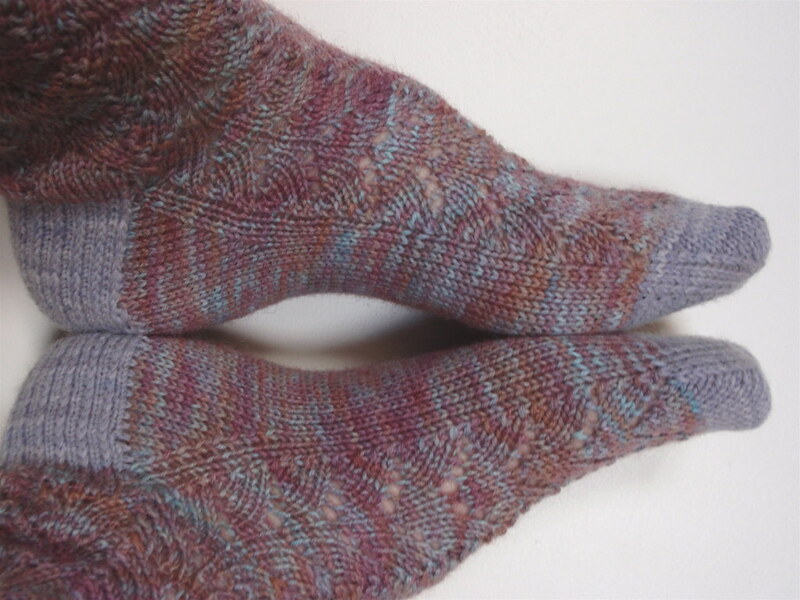 I had some grey Araucania left over from a previous project and used that for the toes and heels. The Araucania is quite thick for sock yarn - almost a 5 ply - and it is very soft and comfortable to wear. I made a beginning on socks number 6 this morning. I chose between the last two remaining sock club envelopes and cast on. I've had such a sense of comfort. Yet again a Nancy Bush pattern, (Welsh Country Stockings - ravlink), this time from 'Folk Socks'. The pattern uses the most basic stitches - stocking stitch and two-by-two rib. And the yarn is Patonyl. Plain, predictable, soft, resilient Patonyl in plain grey and cream. All very straight-forward; all very comforting; all very plain. 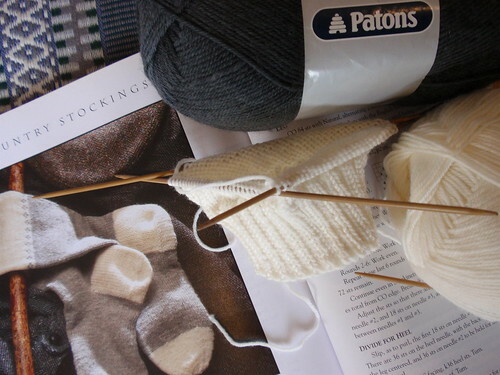 After months of flirtation with beautiful hand-dyed yarns with interesting yarn compositions I have a very definite sense of 'back to basics' in knitting Patonyl in stocking stitch. Let's see if the sense of comfort triumphs over boredom over the next 41 days. I love to travel. I really love to travel. So next February I'm going to spend some time in Paris. Having undertaken recently to avoid the sins of pride and smugness I'm trying hard not to feel too pleased with myself, but I am quietly celebrating the ingenuity that's enabled me to plan a holiday in Paris at a time of very limited disposable income. I've used some aging frequent flyer points to buy my ticket (except for the $590 in 'taxes and charges' I've had to pay) and have organised a house swap through an on-line home exchange site (you have to pay a fee to participate) - three weeks in Paris without accommodation costs sounds ideal. I'd initially advertised for a swap in Amsterdam - my favourite city ever - but when someone from Paris offered to swap at a time that suited me it didn't take long to reconsider my destination. My residence in Paris will be a small loft apartment near the Bastille - a super location. 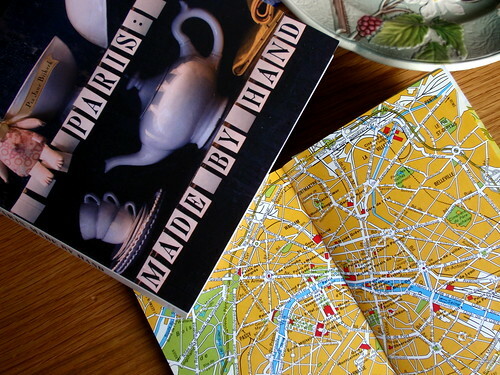 To reward myself for my ingenuity I went browsing in the travel section of Kinokuniya - I find travel books very beguiling - but was eventually fatally tempted by a book I found in the craft section, 'Paris: Made By Hand' By Pia Jane Bijkerk. It's a little book of exquisite photos that provides 'an insider's look at the city's artisans, createurs, and crafts boutiques' (to quote from the Introduction). The only yarn store it includes is La Droguerie, but there are lots of other temptations to browse - both in print and in reality next February. A couple of blog posts ago I reminded myself of the old adage 'pride goes before a fall'. I think I'm going to have to extend this to include 'smugness goes before a fall'. Smugness is probably a form of pride, after all. I've just been having lunch and I noticed - that is, really looked at and noted - the bowl of yarn before me on my table. 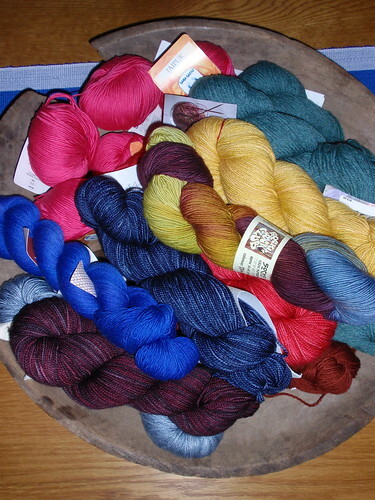 I'd read RoseRed's post about her yarn accumulation for September with awe. I'd marvelled at MissyFee's holiday purchases and wondered at JP's birthday yarn. I had been thinking these knitters are quite different from me; that they are SERIOUS knitters with SERIOUS yarn collections. I would never have so much yarn just lying around (or neatly categorised) and doing nothing. But...this bowl of yarn has accumulated (notice my careful use of passive voice to distance myself from the accumulation) in just over a month! It started with gift yarn for my birthday at the end of August - 100g of Lush Yarn 4 ply silk in 'Precious' and 125g of Socks That Rock in 'Tide Pooling' (fortunately its companion piece in 'Jade' colourway is currently being knitted up or it would be in the bowl too). It was augmented by a visit to Tangled Yarns in Brisbane and the acquisition of 400g of Cascade 220 in a deep greeny aqua colour and 100g of Malabrigo Sock in Boticelli Red. Along the way I was tempted by some beautiful Knitabulous 50/50 wool/silk in 'Curry' and 150g of Wollmeise in 'Hortensie'(courtesy of a so helpful enabling knitting friend). I purposely bought 250g of bright pink Lana Gatto Jaipur cotton for a jacket for the dotee (I take responsibility for this one because it has a clear and intended outcome). But what's really pushed this yarn acquisition over the top was the impulse on-line purchase of three 100g skeins of Madelinetosh Tosh Sock in 'Ink' (perfect name), 'Oxblood' and 'Scarlet'. I remember the motivation for the purchase - I loved this yarn when I knitted my Lichen Socks and in the euphoria of finishing the socks felt I just had to have more. All in all, 30.5 RoseRed units (that's 50g lots to the uninitiated) of yarn acquisition in just over a month. More than a kilo and a half. I really think I'm going to have to face up to the extent of my yarn gathering. I can no longer pretend that only other people acquire yarn that they cannot immediately knit. I promise not to feel smug about other people's yarn temptations in the future.